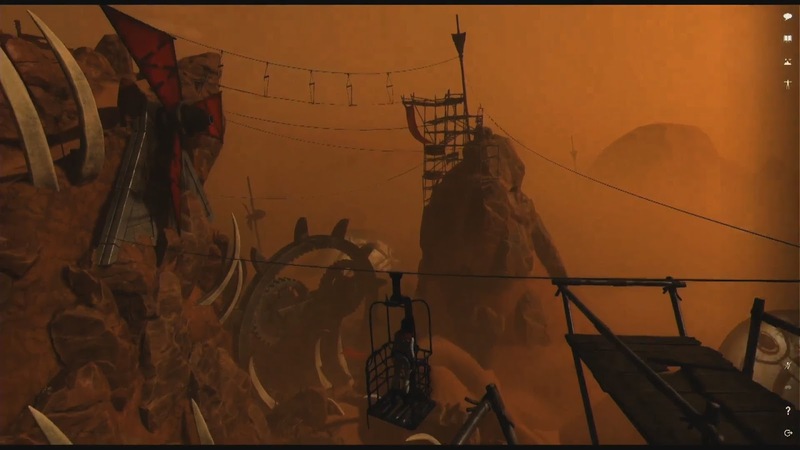 At the Collision conference Ebbe Altberg (CEO of Linden Lab) had a presentation which included some short images of Project Sansar. The video is not yet online so if you’ve missed it, you’ll have to wait. The Collision team will put the video online but it may take a few weeks. Luckily for us all, Maddy Gynoid was on standby, watched the live stream and took a few screenshots. With his permission I share them here, you can also visit his personal blog to read the actual article he wrote in German by clicking this link. This first picture shows us a science fiction type of post apocalyptic world. It looks wonderful but perhaps most interesting about this screenshot are the buttons, or lack thereof! Sound, controller, help and escape? Chat, map, build and avatar? This next picture got me very excited as it shows a theme I love; archeology. I’d love to dig up some virtual ruins. But it is also interesting to note that the shadows, clearly from some sort of grid or skylight above, doesn’t seem to work on part of the ruim that is sticking out. Another wonderful picture, as a history addict, it makes me very happy to see subjects such as these, I can’t wait to go explore some ancient locations like these. Interesting detail is the bit at the top of the passage there, looks like the 3D scanner didn’t quite get that corner scanned properly. 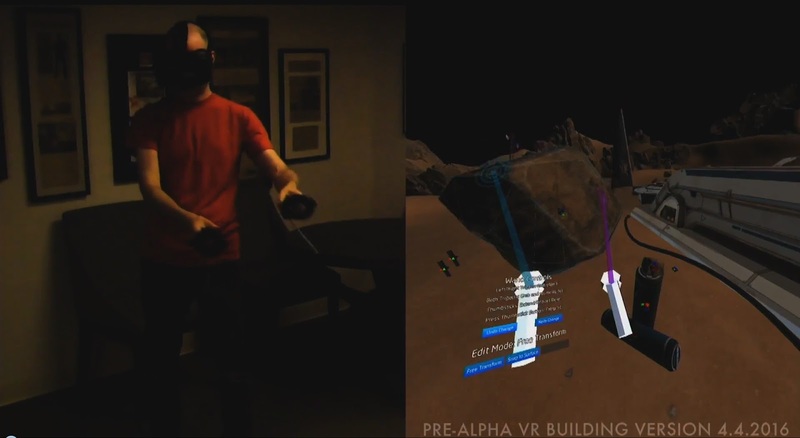 The last picture here shows someone building within Sansar with an Oculus and the Oculus controllers. It looks interesting and I for one look forward to building within world while using a VR headset… as soon as I can afford one that is. From the screenshot we can’t conclude that much, can we actually build inworld like this or is it just a matter of moving bits around that we’ve bought on marketplace or build in Blender or Maya? As soon as the video is online I’ll probably share it here and let’s see what else we can learn from that. This is really exiting!! 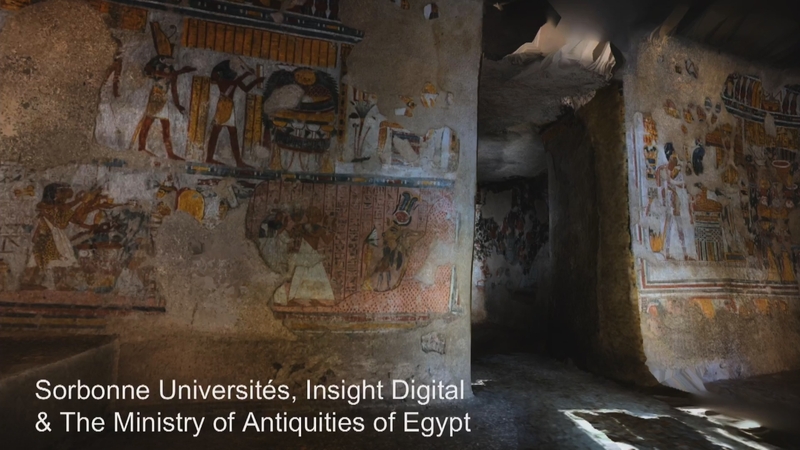 The Egypt image is so real looking! thank you for sharing! Today (Thursday), Ebbe is speaking at the SVVR 2016 from 3:00 PM to 3:20 PM PDT (Midnight to 0:20 CET). Perhaps he will show the same video as on the Collision conference. The live stream of the SVVR is here on YouTube. Those look like the HTC Vive controllers. The headset might be a Vive as well, but its too dark to tell. 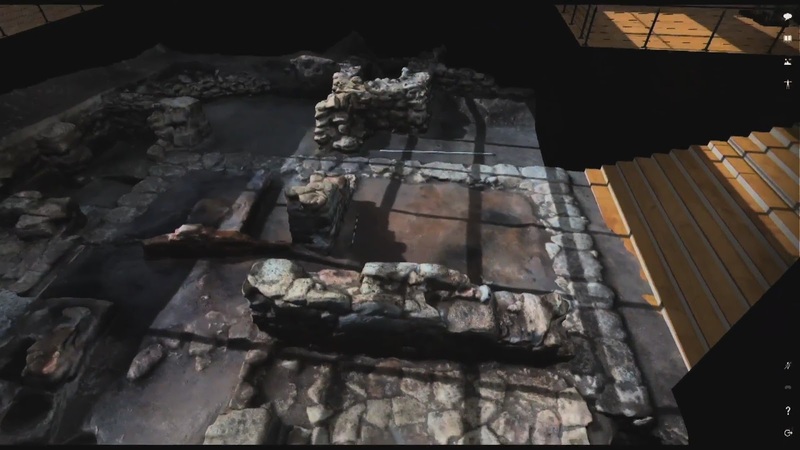 a few hours inside Maya you could repeat this, hopefully not a vaporware presentation. Successor of what? If Ebbe really expects users to dump Sl for Sansar i fear will be sacked even sooner then i predicted before, end of the Year.